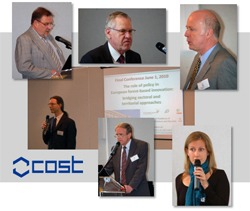 The Final Conference of COST Action E51 “Integration and Innovation in Forest Sector” was jointly organized by the University of Natural Resources and Applied Life Sciences, Vienna (BOKU), the European Forest Institute (EFI), the Forest-Based Sector Technology Platform (FTP) and COST on 21 April 2010 in The Royal Flemish Academy of Belgium for Science and the Arts, Brussels, Belgium. (2) Initiate a cross-sectoral discussion on how to better coordinate policies for an innovative forest sector, in both the territorial services of forests as well as wood value chains. The outcome of the conference will also be published as a separate article in the COST E51 Book II (to be published in 2011). It will include the summary of the discussions and possible recommendations of the event.